Do you ever feel that you’re working hard, doing your best and speaking up but no one notices? The six skills covered in this professional development program may seem simple, but few learn and take advantage of them to enhance their career. This program is ideally suited to professionals in the early or mid-stages of their career. It can be delivered in-person as a keynote or workshop, or virtually. A companion Minibük is a value-added addition to this program. This presentation was completely and utterly awesome. This was the best break-out seminar I attended the entire conference. Thank you! I learned so many things that I can bring back and improve upon in my everyday life and work. For people interested in growing professionally, her messages are simple, powerful and clear! Her message is delivered in a manner that can actually be put into practice. 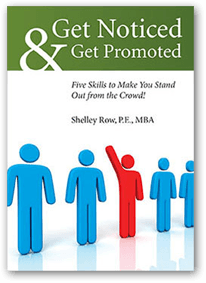 Shelley is not only knowledgeable but her demeanor is infectious – you will want to use all of the skills that you learn. The seminar will provide a great insight to “who you are” and reassurance of how it is beneficial in your career. She is a powerful presenter and delivers a great message.